After falling behind 4-0 last night, the Yankees rallied for a 5-4 walk-off win over the White Sox, giving them 16 wins in their last 22 games. They have been taking care of business against bad teams these last three weeks. Anyway, here’s a rare mid-series thoughts post because I have some stuff scattered in my head and jotted down in my notebook that I don’t want to sit on any longer. Let’s get to it. 1. The Yankees are 84-48 right now — hooray for a palindrome record! — so they have to go 16-14 the rest of the way to reach 100 wins for the first time since winning 103 games in 2009. The schedule does toughen up a bit in September (three with the Athletics, four with the Rays, six with the Red Sox), but 16-14 seems very doable. Through 132 games last season the Yankees were 70-62. They are 14 games ahead of that pace this year. The Indians finished with the best record in the American League last season and they were 76-56 through 132 games. The Yankees are eight games ahead of that pace. The eventual World Series champion Astros were 79-53 through 132 games last year. The 2018 Yankees are five games ahead of that pace. This team is so freaking good, man. Even with all the injuries and Luis Severino’s recent slump. They’re just so good. They’re so good and I feel like not enough people have taken a step back to appreciate just how good they are. The 2018 Yankees have to be the most complained about great team in the social media era. Hands down. 2. By my unofficial count, only 48 55 times in their 132 games have the Yankees had Gary Sanchez, Didi Gregorius, and Aaron Judge in the starting lineup this season. They were their three best position players last year and only 48 55 times have all three been in the lineup so far this season. Hopefully that number increases soon — Sanchez and Gregorius could be back as soon as this weekend, though Judge is still a ways off, it seems — but it won’t increase much. There’s not much season left. Sanchez, Gregorius, and Judge will be in the lineup together maybe 60-something times this year and still somehow this team is on pace to win over 100 games. Never in a million years would I have thought the Yankees would be able to maintain a 100+ win pace with those three spending so little time in the lineup together. I know it sounds silly when dudes like Shane Robinson and Kyle Higashioka are on the roster, but that is a testament to the team’s depth. There’s been a “next man up” mentality all season. 3. I know he’s slumping a bit right now but I can’t say enough about how well Giancarlo Stanton has played the last few months. Last night was his 81st consecutive start — his last game off was May 28th — even though he’s been battling that tight hamstring more than a month now. Going into last night, in the first 80 games of these 81 straight starts, Stanton hit .298/.369/.554 (146 wRC+) with 21 homers. That is big time production. Stanton’s little slump right now is nothing to worry about. It’s his first real slump since what, April? It was bound to happen. He’ll snap out of it before you know it. Point is, Stanton has been an impact player since his rough start to the season, and he’s doing it while playing hurt and never taking a game off. Chances are he’ll never hit 59 home runs again because hitting 59 home runs is extremely rare — Stanton had only the tenth 59+ homer season in MLB history last year — but he’s been playing every game because the Yankees have needed him to play every game, and he’s been extremely productive. What a ballplayer. 4. I am so very happy Dellin Betances bounced back this season. He is a personal favorite and the end of last season was such a mess for him. Betances became persona non grata in September and in the postseason and it was entirely deserved. He pitched poorly and Joe Girardi couldn’t trust him in important innings. Dellin started slow again this year and pretty much everyone doubted him. Lots and lots of folks were ready to give up on him. The Yankees stuck with him and are being rewarded with another elite relief season. Betances currently has a 2.14 ERA (2.15 FIP) with a career high 44.4% strikeout rate and the second lowest walk rate (9.3%) of his career. Pretty much all the key late inning guys have had a hiccup at some point this summer. Aroldis Chapman’s knee has been an issue lately, Chad Green stumbled around the All-Star break, and David Robertson has given up some untimely home runs. Betances has been a rock since April. Three runs and 32 baserunners in his last 39 appearances and 38.2 innings now, with 66 strikeouts. What a beast. So happy for Dellin. 5. The Yankees already have six 20-homer guys this year and Sanchez is not one of them. Stanton, Judge, Gregorius, Miguel Andujar, Gleyber Torres, and Aaron Hicks. Those are the six. Sanchez is sitting on 14 home runs and I wouldn’t put hitting six homers in September past him. The 2018 Yankees have a chance to become only seventh team in history with seven 20-homer hitters, and only the second Yankees team to do it, joining the 2009 squad (Robinson Cano, Johnny Damon, Hideki Matsui, Jorge Posada, Alex Rodriguez, Nick Swisher, Mark Teixeira). 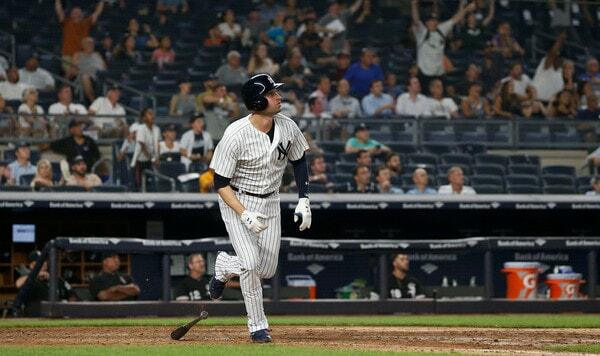 The Yankees already have nine players with 10+ homers this season with two others (Austin Romine, Neil Walker) sitting on nine homers. Only four teams in history have had eleven players hit 10+ home runs (2004 Tigers, 2015 Astros, 2016 Twins, 2017 Astros). The Yankees could do it this year. That is pretty incredible. There is power up and down the lineup and it showed in last night’s game. The No. 3 (Hicks) and No. 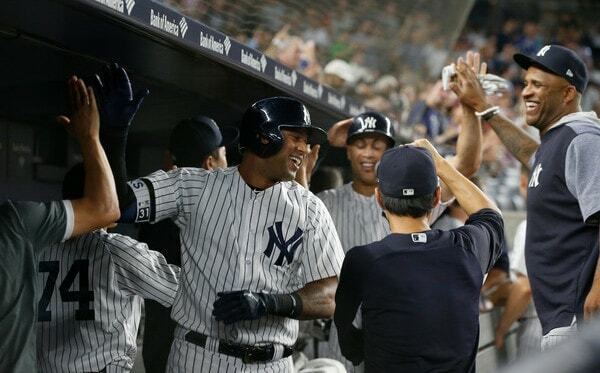 4 (Andujar) hitters both went deep, and a dude came off the bench (Walker) to hit a pinch-hit walk-off homer. 6. Speaking of Walker, I am getting a very 2012 Raul Ibanez vibe from him. The Yankees signed Ibanez right before Spring Training that year and he was supposed to be a platoon DH. He struggled early in the year, then once injuries forced him into everyday duty, he really hit his stride and had all those big hits late in the season and in the postseason. Walker signed in Spring Training, was supposed to be a part-time utility guy, and didn’t really hit his stride until injuries forced him into everyday duty. Prior to last night’s pinch-hit walk-off homer, Walker was hitting .275/.357/.467 (122 wRC+) in his last 37 games and 140 plate appearances. That looks an awful lot like the .274/.355/.458 (118 wRC+) batting line he put up from 2016-17. Expecting Walker to hit insanely clutch home runs seemingly on demand like Ibanez in 2012 is unrealistic — maybe last night was the start of a clutch homer binge! — but the point is he’s a quality player who started the season terribly, and has played very well lately, once his playing time increased. He’s done it while playing right field too. Dude has been a total pro. He’s playing wherever he’s needed, he never ducked questions about his early season struggles, and he never pouted about his lack of playing time. It took a little longer than we all would’ve liked, but Walker has found his way and he’s contributing on the regular. 7. Once Judge returns from the disabled list and goes back to right field, Walker has to take over as the starting first baseman. Luke Voit is fine and all, but give me Walker over Voit. There is a minimum acceptable level of offense in Major League Baseball and Greg Bird isn’t coming close to it with his .196/.284/.384 (80 wRC+) batting line. He’s going to reach 300 plate appearances later this week. This isn’t that small a sample any more. Bird has been terrible and the Yankees have been patient, and we’re reaching the point where putting the best team on the field has to take priority over hoping a player snaps out of a long funk. Once Judge returns, the best team the Yankees can field has Walker at first base, not Bird (or Voit). Maybe Bird will start hitting between now and the time Judge returns and forces the issue. That would be cool. Aside from the occasional homer though, he’s been a zero at the plate, and I don’t think the Yankees can afford to continue waiting on him. He gets until Judge returns. That has to be it. Then it’s Walker time. 8. I feel like we can already pencil Lance Lynn in for one of those heroic three or four-inning relief appearances in the postseason. Know what I mean? The starter gets knocked out early and he holds the other team down, allowing the offense to get back in the game. That sorta thing. Right now I have to think the Yankees would go with Luis Severino, CC Sabathia, Masahiro Tanaka, and J.A. Happ as their four postseason starters in whatever order. Lynn has experience pitching out of the bullpen — the Cardinals regularly used him as a high-leverage guy in the postseason during their heyday from 2011-15 — and he seems to have the right mentality for it. I don’t see the Yankees carrying Sonny Gray on the postseason roster because there’s just no way to trust him. That means Lynn takes over as the long man. Lynn has one of those “Lance Lynn is the unsung hero of this game” relief appearances coming this October. You heard it here first.